Prepare an 8x5 inch bread pan by buttering generously. You can cut a piece of parchment paper to fit the bottom of the pan, fit it in and then butter that too, if you like - this ensures that nothing sticks to the bottom of the pan. In a large bowl, combine the flour, cocoa, sugar, baking powder and soda and salt - set aside. In a smaller bowl, or a two cup measure, combine the egg, vegetable oil, yogurt and vanilla. 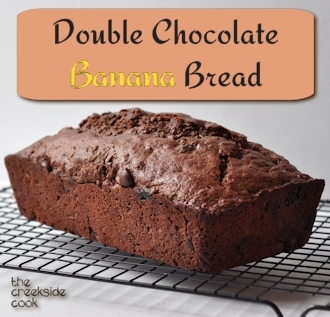 Add the yogurt mixture, the cut up bananas and the chocolate chips to the dry mixture and fold together just until combined. Scrape evenly in the prepared pan and bake for 60 to 70 minutes. It is done when a toothpick inserted near the center comes out clean - you may have to try more than one spot to make sure you aren't hitting a chocolate chip. Cool in the pan for 5 minutes and then remove to a cooling rack - cool completely before wrapping tightly to store. Refrigerate if there is any left after about 2 days.